All NIOS DELED trainees who have recently written 506 and 507 courses exam are all waiting for their results. 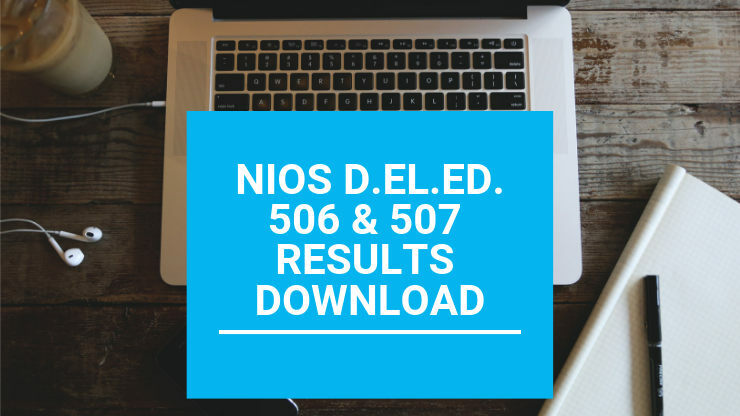 In this post, I am going to give you complete information about NIOS DELED 506 507 RESULT in 2019. The investigation of the recently concluded NIOS DELED THIRD SEMESTER EXAM 2018 has been under progress in the investigation of the ANSWER SHEET. The inter-state arrangement has been done for PAPER CHECKING. It means the copy of a state has been sent to another state's regional office. NIOS DELED 506 507 RESULT 2018 has been scheduled for 45 days from exam conducted date. We are going to tell you what your DLED 2018 RESULT DATE is and how can you see RESULT? LATEST UPDATE - NIOS HAS ANNOUNCED 506 507 RESULT ON 27 FEB 2019. CHECK YOUR RESULT HERE. NIOS is an OPEN SCHOOL, Free School, established in 1989, to achieve the goal of Universalisation of Education by the Ministry of Human Resource Development (MHRD) of the Government of India. National Institute of Open Schooling has the right to enroll, take exams and certificates in pre-graduate level courses. NIOS provides free and distance education to needy learners (ODL) for secondary, higher secondary and Provides vocational education courses and this work is done by thousands of agencies and scholars spread throughout the country and abroad. At today's date, it is operating hundreds of courses in BASIC EDUCATION as well as engineering and technology, agriculture and commerce, health and paramedics, home science, computer, teacher training. Those people who have left studies in the middle or have failed or are unable to read further due to time constraints, this is a boon for those people. At present, running a DIPLOMA IN ELEMENTARY EDUCATION (D.EL.ED) program for untrained in-service teachers is going to establish a new record by training 13 lakh + teachers across the country. In the second year of DIPLOMA IN ELEMENTARY EDUCATION (D.EL.ED.) program (Session 2017-19) for the untrained in-service teachers, under the 3rd SEMESTER course, 506 (Understanding Children in Inclusive References) and 507 (Community and primary education) were examined here. This examination was conducted on the whole nation together on 20-12-2018 and on 21-12-2018. Now it is a turn to know the results of these subjects. According to the guideline of NIOS DELED exam results will be done within 45 days from the conclusion of the examination. So far the examination result of 1st SEMESTER (501 502 and 503) and 2nd SEMESTER (504 and 505) came only after 45 days. Accordingly, the RESULT of the NIOS DELED 3RD SEMESTER EXAM RESULTS 2018 is expected to reach the first week of February 2019. NIOS DELED 506 507 RESULT 2018-3RD SEMESTER can be viewed on the NIOS official website DLED.NIOS.AC.IN. If you want to know about NIOS DELED 506 507 RESULT 2018-3RD SEMESTER, then you should wait till the first week of February 2019. We will notify you immediately as soon as the result is published. You should also know that the final date sheet has been released for the last semester of NIOS DELED EXAM, which will have 508 509 and 510 courses. You can read this post for more information. For any questions or suggestions related to this post, please comment on it below and share it with other friends.